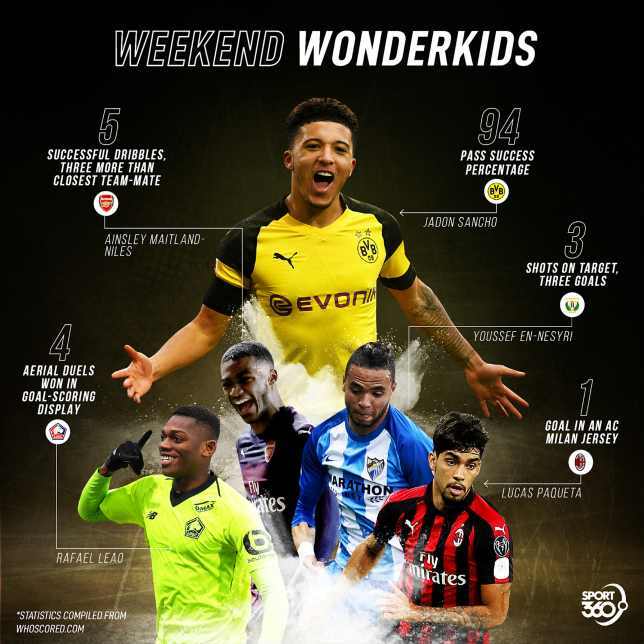 Barely a week passes by without Jadon Sancho causing the football world to gawp, and the Borussia Dortmund wonderkid will be pleased to know he’s made it back into Weekend Wonderkids. The aim of this weekly column is to shed light on the players, aged 21 or under across Europe’s top five leagues, who aspire to lead the game into a bold new era. The likes of Kylian Mbappe, Marcus Rashford and Ousmane Dembele are sure to regularly pop up but as every week passes, we hope to sift out a few starlets who may have gone unnoticed. Without further ado, here’s our five picks from last weekend’s action. Dortmund continue to feed hope to a sub-standard Bayern Munich in the Bundesliga title race thanks to frustrating back-to-back draws, having inexplicably blown a 3-0 lead with just a quarter of an hour to go. Sancho, for his part, was almost blameless. How about that goal – the ball seemed to stick in the turf upon his first touch from Lukasz Piszczek’s pass, but somehow hooked the ball along with his second while running at full pelt. Then the finish, drilling home from just about the only angle that could have evaded both the outstretched defender and keeper Oliver Baumann. Baumann then handily parried a Sancho shot into the path of Mario Gotze, who tucked away for 2-0 before the first half was out. The best was arguably to come from the 18-year-old in the build-up to Borusssia’s third, an audacious backheel nutmeg before Raphael Guerreiro completed the move. That was during his ‘less’ effective second half. Don’t forget he hit the post, too. Find us a better teenage footballer. Sunday was an emotional day for Lucas Paqueta in more ways than one, as he dedicated his maiden goal for the Rossoneri to former club Flamengo, where a fire broke out that saw 10 young players lose their lives last week. 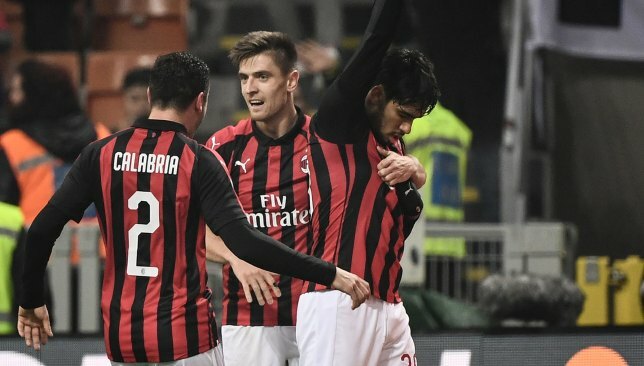 The Brazilian midfielder raced on to Davide Calabria’s inch-perfect cross and lashed in with his left, before pointing to the sky and bowing his head in tribute. It was just his fourth league appearance for Milan. He is a risktaker on the ball, much like his spiritual San Siro forebearer Kaka, but far more menacing off it. In addition to his offensive contributions – including two key passes – Paqueta snapped at Cagliari heels to the tune of three tackles and an interception. Life will never be safe and simple for Milan with Paqueta, as he only completed 70 per cent of his passes. 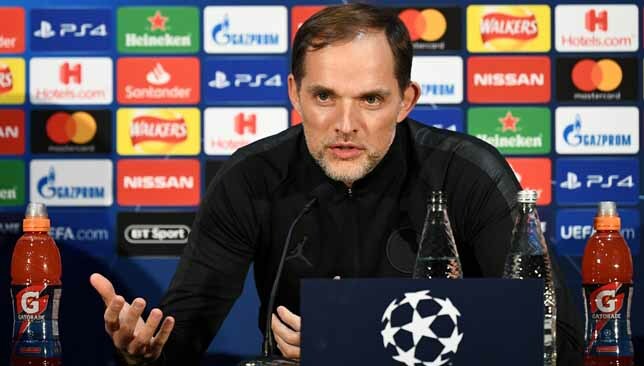 But it’ll sure be fun, especially with fellow January signing Krzysztof Piatek in front of him. Ainsley Maitland-Niles felt the need to apologise directly to Arsenal fans who criticised his performance at Huddersfield. Perhaps he should just have reeled off his impressive statistics instead. Yes, stats don’t tell the story of the whole game, and Maitland-Niles did put the Gunners in a couple of hairy situations by giving the ball away. Consider though that he was just back from injury – and is still learning the position of a wing-back – and the whole picture becomes mightily impressive. With Sead Kolasinac hurtling up the left flank, Arsenal completely overran the Terriers in the first half and the game should have been sewn up there and then. But 21-year-old Maitland-Niles – who has stated that he views centre midfield as his most comfortable position – was arguably the more efficient of the two. His delicate pass into Alex Iwobi should have deserved a better finish and he also picked out Henrikh Mkhitaryan on the edge of the box, who could only find gloves. Finally he got his reward – whipping a cross into Alexandre Lacazette, who would have struggled to miss it. With Hector Bellerin out for the foreseeable future and Stephan Lichtsteiner a disaster so far, there’s a chance for the taking on the right-hand side. 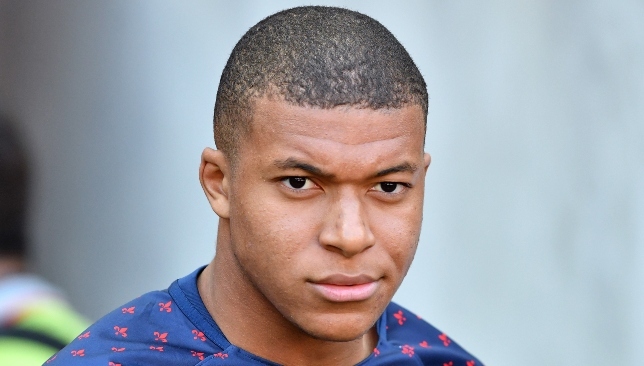 The first thing that stands out about the ‘Portuguese Mbappe’ is that he doesn’t really play like Kylian Mbappe. The 19-year-old certainly has a decent lick of pace yet he’s just as likely to hustle a defender off the ball as he is to hare away from one. Whatever method he uses, it’s clear that he instinctively knows where the goal is. At no point did Leao look up before barging his marker and thundering a shot from a difficult position onto the post in the early stages against Guingamp, before going close with a similarly arrowed effort. His eventual strike, a short time into the second half, was not exactly precision but he did awfully well to wrap his body around a cross with his back initially to goal. Guingamp just couldn’t contain his 6ft2in frame. By the time he left the pitch in the 74th minute he had won four aerial duels, the most of any Lille player bar impressive centre-back Gabriel. Alongside Andre Silva, Joao Felix, Bernardo and Goncalo Guedes, a Cristiano Ronaldo-less Portugal should sure still be exciting. The second appearance for a player on these pages who few outside the Arab world and La Liga have cottoned on to yet. Youssef En-Nesyri is having himself a mighty fine 2019 indeed. Up to New Year’s Eve, the Moroccan had just scored just one league goal for Leganes all season. Now he’s up to seven from five games in one-and-a-half months, helping his side streak clear of the relegation zone. The giant of a man is now a giant of a finisher. He squandered two chances in the opening two minutes – the first via his wonderful chestdown – but got off the mark in the 22nd minute after finding space from a corner (though was his shot going wide before the deflection?). There was no doubt about the second. The timing of his run was exquisite as he barged his way from an onside position and onto Jonathan Silva’s cross. The third? My word. Pace, power and timing – again – combined forces at the end of a brutal counter, with the 21-year-old finding enough oomph from a side-footed effort to beat Pau Lopez from outside the area. If En-Nesyri stays true to his New Year resolutions, a bigger European club may find the resolve to sign him in the summer.